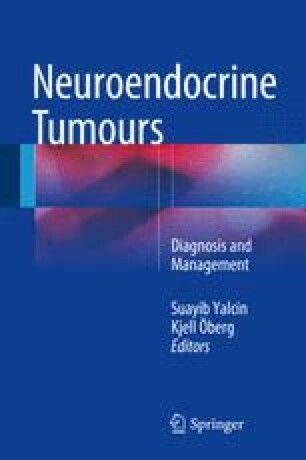 Peptide receptor radionuclide therapy (PRRT) is an internal radiation therapy which is based on specific binding of therapeutic radiopharmaceutical to somatostatin receptor (mostly sstr2) and internalization of receptor-radiopharmaceutical complex to exert radiation damage to neuroendocrine tumour cells. Although all kinds of tumours which have overexpression of somatostatin receptors are theoretically candidates for PRRT, it provides more successful results for gastroenteropancreatic and bronchial neuroendocrine tumours followed by some neuroectodermal tumours such as paraganglioma and some other tumours like thyroid medullary carcinoma or undifferentiated thyroid cancer with sstr2 overexpression. 90Y-DOTATOC and 177Lu-DOTATATE are currently the mostly preferred radiopharmaceuticals for PRRT. PRRT is administered in 2–6 cycles of therapies, depending on the radiopharmaceutical used and on the clinical status of the patient. The dose-limiting organ for PRRT is the kidneys followed by the bone marrow. The patient should be assessed for an adequate renal function and bone marrow reserve in pretherapy setting. Renal toxicity can be reduced and avoided by kidney protecting amino acid solution infusions, which are administered just before PRRT. 90Y-DOTATOC usually causes more renal and bone marrow toxicity in comparison with 177Lu-DOTATATE. Therefore, 177Lu-DOTATATE should be the choice of radiopharmaceutical in case of compromised patients. PRRT with 90Y-DOTATOC and 177Lu-DOTATATE has been practised for about a decade, and studies have so far concluded mostly partial and complete objective response rates in approximately 30 % of patients without any serious side effects and severe toxicity when applied properly.